Today is World Industrial Design Day. (29th June). How does it change anything for you? Let’s say, by now you have brushed your teeth, put on a kettle, had a cup of tea and showered. That means you have been touched by the work of an industrial designer. The toothbrush, the kettle, the coffee mug, the shower, the lounge chair have all been designed by industrial designers. But the moot point is this: did you have a good experience? Did the toothbrush seem worth the price? Did the kettle safely dispense hot water? Did the cistern flush properly, saving water? Did the shower work well? Is the chair ergonomical to read broadsheet newspapers? If not, there is a design problem. Design and designers influence the way we live, work and play. They work to make the whole experience worthwhile. They deal with form, function, safety, maintenance, graphics, packaging, colour and aesthetics of products and systems. Designers are trained to make a product functionally better, aesthetically appealing, easy-to-manufacture and considerate to the environment. In short, it makes a product a delight to own and use. When was the last time you were delighted by design? In India, very often, one feels let down by bad design. Have you ever wondered why an alarm did not go off in the morning as set? Or a toothbrush packaging that is difficult to tear open? Low slung Japanese cars always get stuck in the monsoon onslaught on Indian roads. Chairs in a conference room which are not comfortable for long hours. Door handles that don’t turn properly is a regular irritant. All of us have mobile phones with features we hardly use. Washing machines have no programmes for chunnis, turbans and 9-yard sarees. Public buses and trains that are difficult to climb for the elderly and the differently-abled. Bank ATMs that are too difficult to decipher is a common complaint. Toys that are unsafe for children are a common concern. The list can go on. So why does this happen? Often times, the designers are called upon only when things go wrong. Businesses look at design as an unnecessary expense that add to the costs. Price of a product is still more appealing than safety features. And the lowest quoted contractor gets to build the park bench or the bus stand. Companies do not realize that bad design works out to be more expensive in the long run. Brands lose their sheen, re-calls are expensive and bad word spread faster than good word. How do designers work for a better product experience? By empathizing with the user. By applying design thinking, designers work towards creating better products and systems. Designers have been trained to be people-centric, business driven, eco-friendly and responsible. Why do Indian businesses get away with bad design? 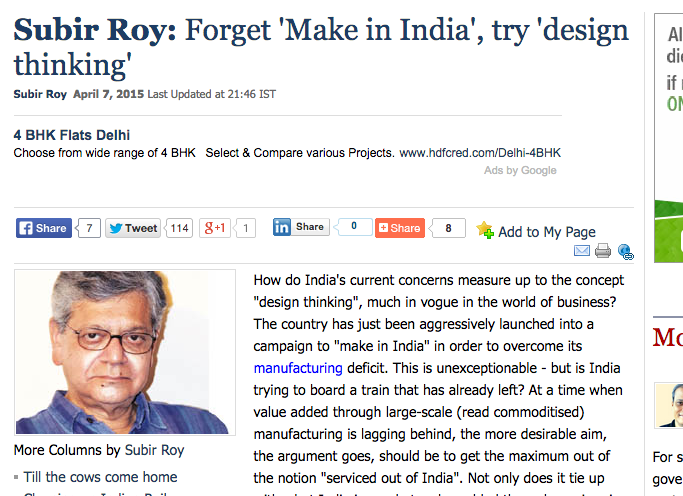 Because, we still do not demand better design from our industries. Consumers are used to badly designed products everywhere around us. We need to grow to expect better design. We need to build a constituency that appreciates good design. Lets demand quality and safety. Lets surround ourselves with good-looking products. Lets educate ourselves about making products sustainable. Lets put a premium on delight of ownership. When customers grow to expect that, businesses would have no choice but to cater to customer demands. And will begin to look at design as an integral part of the product cycle. An investment that is required for a good business. Till that happens, World Industrial Design Day will only be a celebration of a select few.